Hawick's Shawn Muir is a hard man to bring down as he shows his strength during the weekend win over Glasgow Hawks. A heartbeat was finally found at Mansfield Park on Saturday as Hawick earned an impressive 24-17 victory over Glasgow Hawks. After flatlining for most of the 2016-17 season, Hawick rose from the depths of relegation purgatory to secure a come-from-behind victory over play-off chasing Glasgow Hawks at a frozen looking Mansfield Park. The Robbie Dyes rode the production of Scotland under-20 standout, Darcy Graham, and an energised young squad that managed to fight back from a 17-7 second-half hole. A brace of scores from Graham were added to by Shawn Muir with Ali Weir chipping in with three conversions and a penalty to help the Greens secure a victory that lifted them into the relegation play-off places and four-points ahead of bottom placed Gala with three league games remaining. “Without a doubt we totally deserved that result,” said a delighted Greens captain, Bruce McNeil. “That was a very good Glasgow Hawks team filled with professionals, academy boys and Scotland 7’s players. “We had a game plan to turn their backs and make them really work for every inch, something we didn’t do when we played them on their pitch. 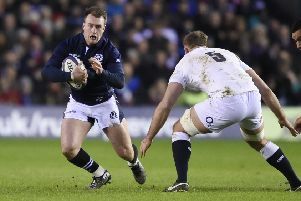 Hawick landed the first punch when Graham latched onto a pinpoint cross-field kick from Rory Hutton, plucking the ball from the air midstride before racing home untouched for the opening try, Weir converting. Ross Miller countered for Hawks, squeezing over following a well rehearsed catch-and-drive lineout move, George Horne levelling the scores. Andy Hill then gave the Glasgow side a 12-7 halftime lead after dotting down from another set-piece attack. Brendan McGroaty continued Hawks dominant display after the break, brushing aside two weak tackles. McNeil then fell foul of the new tackle rules implemented by world rugby with a yellow card but the visitors failed to make their man advantage count and soon found themselves down to fourteen men when Stephen Leckey was sin-binned for an off-the-ball scuffle. Weir used the subsequent penalty to pull the Greens within seven-points and from that point forward, Hawks couldn’t keep up. Graham added his second score quickly followed by Muir, Weir converting both, as Hawick took a 24-17 lead into the closing stages and held on.